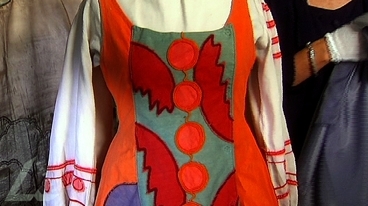 Video clip synopsis – The National Gallery of Australia is home to one of the world's finest collections of costumes from the celebrated Ballets Russes. Broadband MP4 hidden1_bb.mp4 (17.4MB), suitable for iPods and computer downloads. Ballet Russe is an episode of the series Hidden Treasures (15 × 5 mins) produced in 2006. On completion of this unit the student should be able to analyse and discuss the ways in which artists from different times and locations have created aesthetic qualities in artworks, communicated ideas and developed styles. When Betty Churcher joined the National Gallery of Australia in 1990, the first 'hidden treasure’ she found was one of the world’s finest collections of costumes from the celebrated Ballets Russes. Commissioned in Paris by Serge Diaghilev for his revolutionary troupe of dancers, many of these gorgeous costumes have been handpainted by radical young artists who were to become giants of 20th century art, among them: Henri Matisse, Giorgio de Chirico, Natalia Goncharova and Jean Cocteau. Without Diaghilev, the course of modern art could well have been different, because he had the entrepreneurial flair to hear and celebrate the drumbeat of a new century. His genius lay in spotting genius in others. He brought together in creative collaboration some of the most original, inventive and difficult young artists of the early 1900s, such as the painter Pablo Picasso, the dancer Vaslav Nijinsky and the composer Igor Stravinsky. Among the stars in the National Gallery of Australia’s collection is Matisse’s design for the Chief Mourner in the Song of the Nightingale. There’s also Leon Baskt’s costume designed for Nijinsky in The Blue God. It is marked with his make-up, which the gallery’s conservators carefully preserve—for the stains are as much a part of history as the costume itself. After Diaghilev’s death in 1929, a number of new groups followed his original troupe. When the Ballets Russes de Monte Carlo toured Australia in 1940, Sidney Nolan was commissioned to design the sets and costumes for Icare—adding his own brand of poetic lyricism and his Australian accent to this artistic treasure-trove. The National Gallery of Australia has one of the most important collections of modern theatre art in the world. In 1973 at auction, the NGA purchased 47 lots, comprising about 400 assorted items. It has taken years of conservation and research to piece together these various items – hats, belts, coats, trousers, dresses – into about 100 complete or nearly complete costumes. Discuss the NGA‘s preventive conservation of the artworks in relation to: environmental conditions, handling, procedures for storage, exhibition, packing and transportation, pest management. What policies and procedures for these are in place at the NGA? In Indian mythology, the god Krishna is generally depicted with blue skin, the result of being bitten as a child by the evil serpent Kaluja. Carry out research about Krishna and the episodes in his life, then create an illustration for the front cover of a theatre program for a production of The Blue God. Find a folk tale, myth or legend, then design and construct a mask for one of the main characters in the story. To work out the overall design for The Song of the Nightingale, Henri Matisse constructed a small stage out of a wooden crate for all his stage décor and characters. He used little pieces of coloured paper which he moved around inside the stage. Write or find a short story that could be adapted to a stage play, then construct a similar stage setting for the story using recycled boxes and cut paper. After looking at other artworks by Matisse, create a collage of an environment familiar to you, using cut paper shapes in a limited colour range.